Page revised in August 2018. Photos taken with Canon Powershot SX 700 HS. According to Livy Ostia was founded by Ancus Martius, the fourth king of Rome. In Latin ostium meant entrance, a reference to the location of the town at the mouth of the River Tiber. At the beginning it was just a castrum, a fortified settlement, which protected Rome from enemies attempting to attack the city by sailing up the river. Eventually the nature of Ostia changed and it became a commercial and cosmopolitan town where advanced forms of trading were developed. 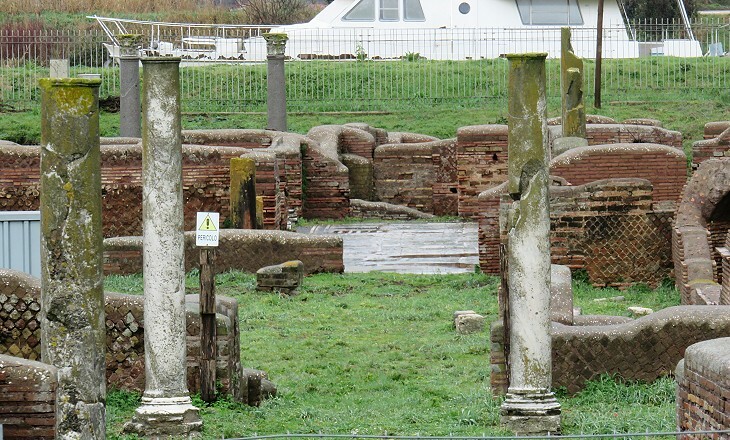 The urban design of Ostia was similar to that of a typical Roman town. It was crossed by Decumanus Maximus in an east-west direction and by Cardo Maximus in a north-south direction. The Forum was the centre of the town as it was situated at the junction between these two streets. 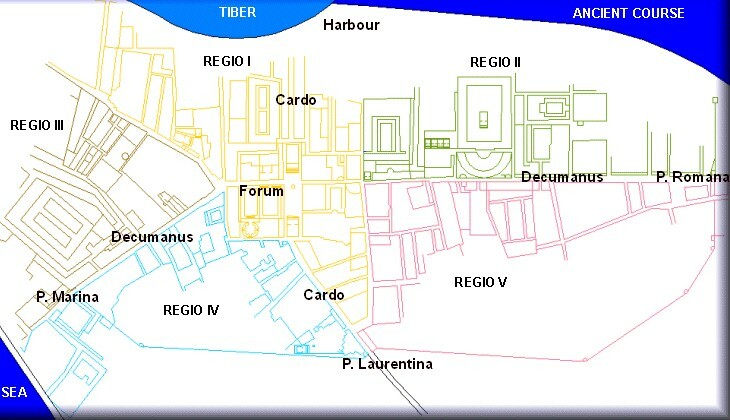 Archaeologists have divided the archaeological area into five regions, three to the north of Decumanus Maximus and two to its south. 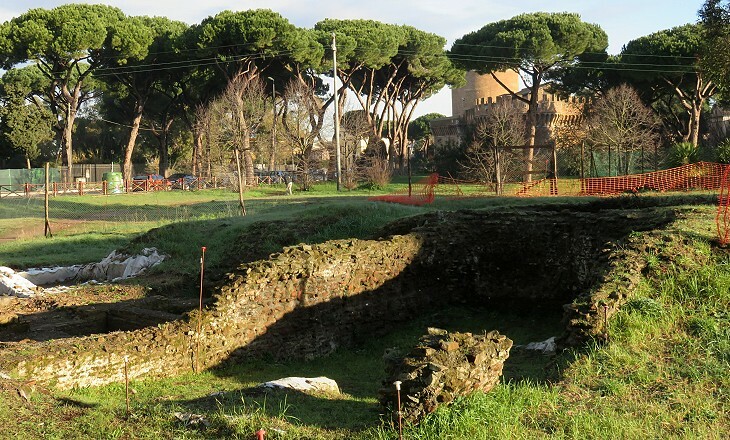 Porta Romana was the final point of Via Ostiense which linked Ostia with Rome, Porta Laurentina allowed direct access to Ostia from some towns near the coast and it was named after Laurentum, a lost town not far from Lanuvium. Porta Marina was utilized by the inhabitants of a residential area along the sandy coastline. Archaeologists have not found clear evidence of a northern gate and of walls along the river where harbour facilities were located. The names of the gates are modern. In the Ist century AD Emperor Claudius decided to build Porto, an artificial harbour a few miles north of Ostia, to ensure supplies to Rome were not affected by weather conditions at Ostia. Over time Porto became more important than Ostia as a terminal for goods. 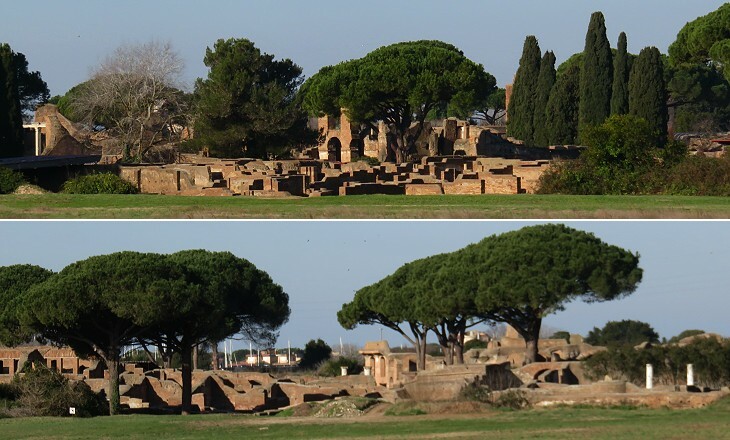 In 120-140 new residential quarters were built at Ostia, following a major fire in 115. Although archaeologists found and restored buildings of different periods, by and large the overall aspect of the town visitors see is that which Ostia had at the end of the IInd century. The large majority of the works of art found at Ostia, similar to the buildings, are dated IInd century, the age of the adoptive emperors and of the Severian dynasty. The almost total absence of Christian buildings/works of art indicates that Ostia very rapidly declined during the early Vth century, most likely immediately after 409 when it was occupied by the Visigoths or even before. In 455 the Vandals sacked the town and in 537 the war between Byzantine and Ostrogoths caused additional destruction. Malaria spread over the area and made it dangerous to live there during most of the year. In the IX century the few remaining inhabitants fled to Gregoriopolis, a fortified hamlet, to escape Saracen raids. 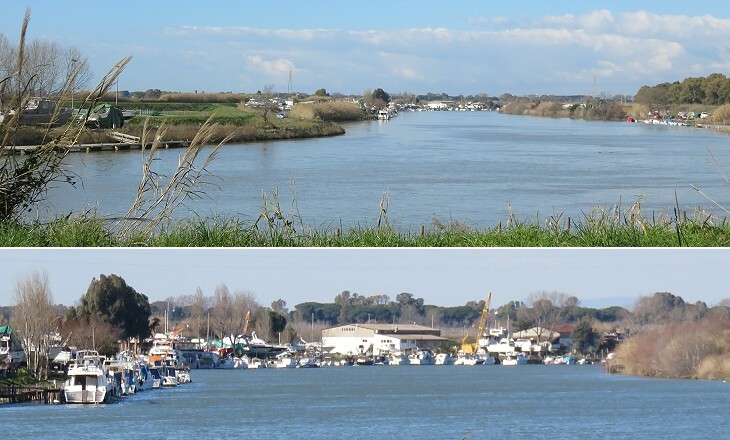 Over the centuries the flood deposits of the Tiber covered the buildings of Ostia as they did in Rome. Today the archaeological area is situated below the river level and high enbankments prevent floods. Because of this the ground is easily soaked by heavy rainfalls and some underground buildings (e.g. Mitreo delle Terme del Mitra) cannot always be accessed. Occasionally the whole archaeological area can be closed to the public for safety reasons. The ruins of ancient Ostia lie scattered along the left bank of the Tiber; and so dilapidated are they that we shall content ourselves with indicating them as they successively present themselves. Along the river, are extensive remains of magazines, corn-stores etc., which belonged to the emporium. (..) The principal temple of the city rises at the extremity of a square area, and is ascribed to the reign of Trajan or Adrian. Beyond it are vestiges of baths, found and destroyed in 1830; after which we reach the remains of the ancient theatre; some of the substructions of its cavea remain. Carl Gustav Jung saw in Leontocephalus a symbol of our time: We have a god not with a human mind but with an animal mind, not conforming to our spiritual expectations, but to our worst fears. (..) We have lost our direction completely, we are not sure of anything, there is only a blind urge, but to what we do not know. So this symbol not only fits one particular case, it is a symbol for our time as well. The first excavations at Ostia were only aimed at finding statues and other works of art. Two painters, Scottish Gavin Hamilton and Irish Robert Fagan, were among the first "archaeologists" who successfully dug at Ostia. Hamilton sold a statue of Antinous to James Hugh Smith Barry for £1000, then the highest known price of any antiquity imported to Britain. In line with the practice of the time the statues were largely restored and completed with the missing parts. The so-called Thalia was most likely a maenad, a follower of Bacchus. Cardinal Bartolomeo Pacca financed digs in 1824-1834 and retained the finds. As reported by Donovan, monuments of Ostia could be "found and destroyed". The so-called Imperial Palace was one of the areas of the first digs. Fagan found there a temple to Mithra, but today archaeologists are unable to locate it, because of the way excavations were carried out. Other excavations were ordered by Pope Pius IX: some of the frescoes which were found in 1868 were cut and turned into a sort of traditional paintings by placing them inside golden frames and by hanging them on the walls of the Vatican Museums according to aesthetic criteria. 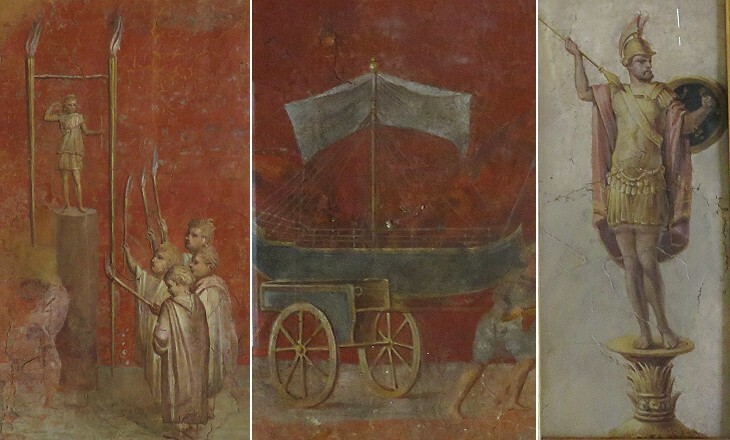 The ancient walls which had only fragments of frescoes were used as building material. At length, on mounting a slight hill, we come upon a wide view over the pale-blue death-bearing marshes, to the dazzling sea, and almost immediately enter a forest of brushwood, chiefly myrtle and phillyrea, from which we only emerge as we reach the narrow singular causeway leading to Ostia itself. (..) On either side stretch the still waters of the pestiferous lagoon, called the Stagno, waving with tall reeds which rustle mournfully in the wind, and white with floating ranunculus. (..) Large sea-birds swoop over the reedy expanse. (..) No building remains perfect in the whole of the great town, which once contained eighty thousand inhabitants. Thistles flourish everywhere, and snakes and lizards abound, and glide in and out of the hot unshaded stones. After a time we turn into other and smaller streets, in some of which there are evident remains of pillared porticoes. A temple of Mithras, supposed to be of the date of the Antonines, has been identified. Baths, richly decorated with mosaics, have also been discovered. (..) The banks are filled with fragments of pottery, and here and there of human bones. The whole scene is melancholy and strange beyond description. Emerging from the narrow, almost oppressive confinement of the ruined streets, upon higher ground still unexcavated, which stretches away in ashy reaches to the mouths of the Tiber and the sea, we find a massive quadrangular building of brick, which is more stately and perfect than anything else, and is supposed to have been a temple of Jupiter. (..) With these recollections in our minds, let us leave Ostia. Augustus J. C. Hare - Days Near Rome - 1875. Systematic digging began in the early 1880s, but it was hampered by the unhealthiness of the site. In 1884 a vast plan for reclaiming the marsh described by Hare was approved. 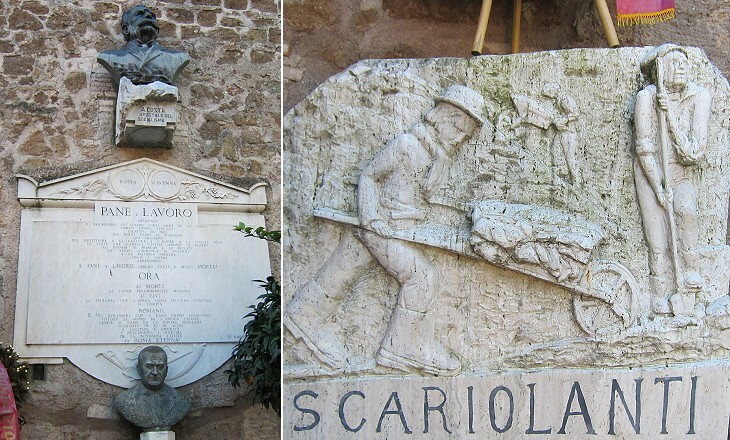 The task was assigned to one of the first Italian worker cooperatives. It was founded at Ravenna where it had reclaimed the marshland around that town. In 1904 the completion of the undertaking was celebrated by an inscription at Gregoriopolis (Pane e Lavoro, i.e. Bread and Work was a key request of the socialist movement). Eventually the reclamation of the area allowed the foundation of Lido di Ostia, the beach of modern Rome. We addressed ourselves to the exquisite Ostian reliquary, an exhibition of stony vagueness half straightened up. The ruins of the ancient port of Rome, the still recoverable identity of streets and habitations and other forms of civil life, are a not inconsiderable handful, though making of the place at best a very small little sister to Pompeii. When James visited Ostia the first systematic excavations aimed at revealing the urban layout of the town had already brought some fruit and a small museum in a former salt depot near the river already housed some of the works of art which had been found. Ostia was a bigger city than Pompeii, but James made reference to the overall interest of the site (as it was when he visited it). 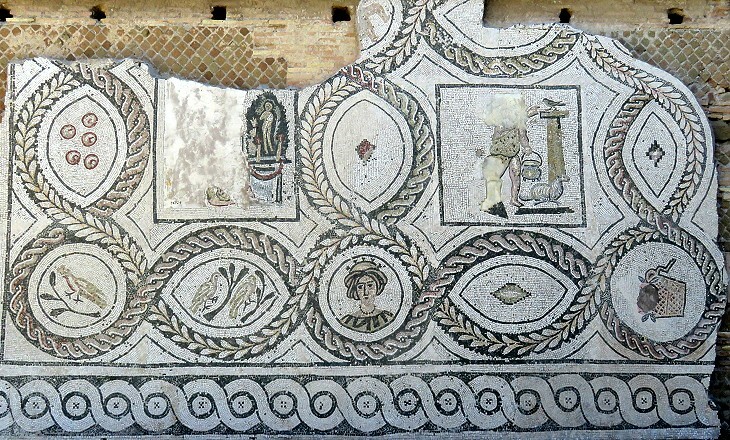 Findings of works of art were not limited to the town of Ostia. In antiquity the area must have been a healthy one because many villas were found in the proximity of the ancient coastline. 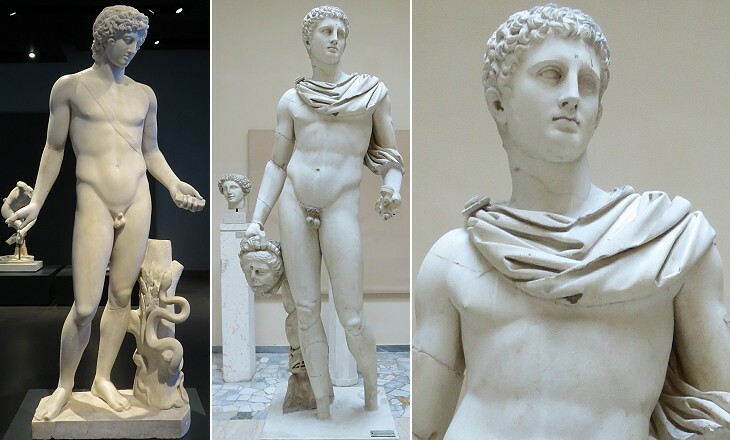 Some of the statues which decorated them could withstand comparison with those found at the time of Pope Julius II, but they came second and did not have the same influence on the history of art. 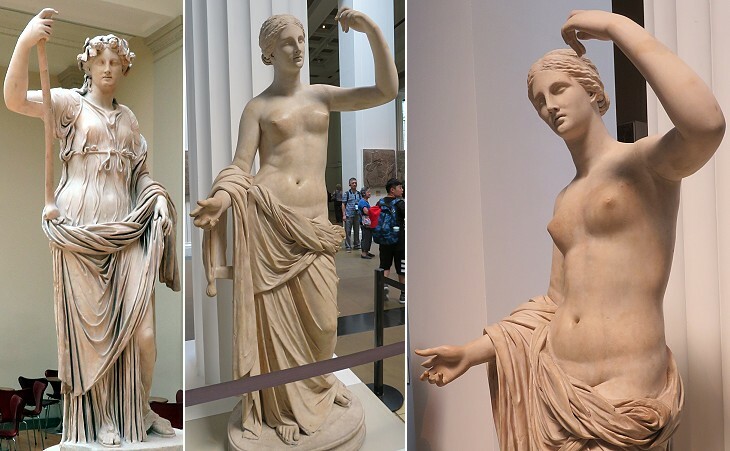 Works of art which were found at Ostia can be seen in museums and private collections throughout the world. 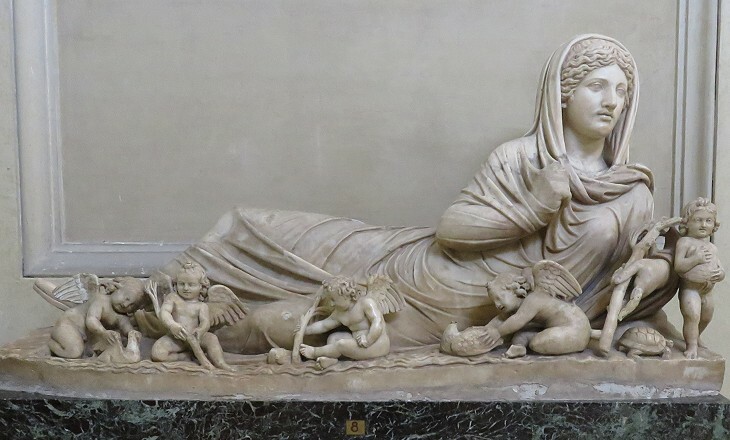 Vatican Museums: a historical collection of exhibits found before 1870. Museo Nazionale Romano: the majority of the findings after 1870. 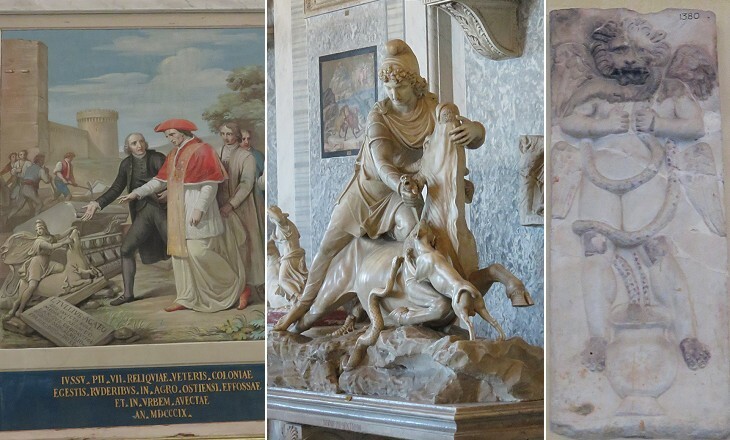 Musei Capitolini: a few exhibits donated by the Popes. 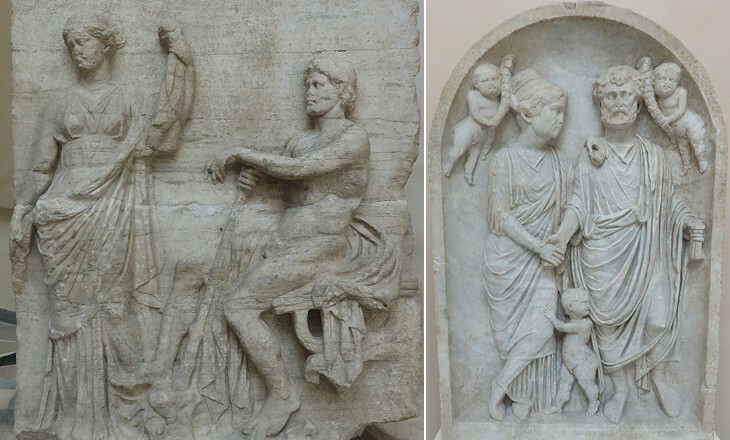 Museo di Ostia Antica: a selection of statues, sarcophagi, gravestones and the originals of all the casts which can be seen in the archaeological area. Museo dell'Alto Medioevo: a stunning reconstruction of a richly decorated hall found outside Porta Marina. In this section many works of art which are now in museums are shown in the page covering the location where they were found. Ostia is by no means a finished chapter for archaeologists. In 2014 evidence was found of ancient buildings and streets on the other side of the Tiber. It is possible that the town had its own Trastevere, a large neighbourhood on the right bank of the river which possibly extended as far as Porto, thus forming an early example of urban sprawl. The photos which illustrate this section were mainly taken in January and February 2015 at a time of the year when the site is more evocative. The image used as a background for this page shows the seating section of the theatre and the icon at the top of the page shows a fresco at the Vatican Museums depicting the loading and measurement of grain on a ship. Uscendo poi fuori di porta s. Paolo, e pigliando il cammino per la celebre via Ostiense, si giunge a quella desolata ma celebre città. Sulle foci del Tevere, dove sboccava nelle sponde del mare tirreno, si vedono i miserabili avanzi della illustre città di Ostia termine del Lazio, edificata da Anco Marzio III. Re de' Romani col famoso tempio di Giove Feretrio; e chiamossi Ostia, quasi porta, ed ingresso agli Eroi, che a Roma portavano i trofei delle provincie conquistate. Abbracciata poi da' Romani la religione Cristiana, fuvvi da Costantino Magno edificata una chiesa in onore de' ss. Apostoli Pietro e Paolo, e di s. Gio. Batista: ma dipoi essendo stata ivi la s. vergine Aurea con un sasso legato al collo gettata nel Tevere, fu tanta la devozione, che ne prese quel popolo, che riedificando la chiesa, in onor di essa la dedicò, e poi fu ristaurata da s. Leone III. e da s. Leone IV. il quale vi andò processionalmente, e vi comunicò tutti i soldati e capitani dell'armata Cristiana, ivi radunata contro i Saracini i quali poi coll'ajuto Divino furono parte disfatti dalla tempesta, e parte rotti, e fatti prigioni, e poi, come dicemmo furono condotti a Roma, ed impiegati nella fabbrica della città Leonina. Appresso alla chiesa vi fu probabilmente un ospizio, in cui s. Agostino si trattenne, quando dopo la sua conversione voleva passare in Affrica con santa Monica sua madre, la quale però avendo colle lagrime guadagnato il suo figliuolo a Dio, quivi morì, e nella medesima chiesa fu poi sepolta, standovi dal dì della sua sepoltura, che fu nel 362. fino all'anno 1430. in cui Martino V. trasportolla a Roma con solennità. Celebre è negli atti de' ss. Martiri non solo la città, ma ancora la via Ostiense, mentre non lungi dalla suddetta chiesa si conserva la memoria de' ss. Ciriaco vescovo Ostiense, Massimo prete, ed Archelao diacono, i quali sotto Alessandro Severo sostennero il martirio, con altri compagni avanti il teatro della medesima città; e tanti e tante gloriosamente sparsero in difesa della Fede cattolica il proprio sangue in quelle campagne: ma sopra tutti è celebre la memoria di s. Gallicano capitano, ed amico caro di Costantino Magno, mentre egli fu il primo, che edificasse chiese in Ostia, e che istituisse prebende per mantenimento de' preti, e chierici, facendo nella sua abitazione un grande ospizio per li pellegrini, che allora da tutte le nazioni ivi capitavano per andare a Roma, e visitare i sagri Limini; insieme con s. Ilario monaco Ostiense servivali con tanta carità, che quanti venivano dall' oriente, e occidente restavano tutti sorpresi di vedere sì grande umiltà in un uomo tanto nobile e ricco; onde sparsesi da per tutto la fama di sì magnanima virtù, e non potendo ciò soffrire l'Apostata Giuliano successore di Costantino, perchè non poteva per la di lui grande nobiltà farlo morire, discacciollo da Ostia; onde andatosene in Alessandria, fu tanto odiata la sua esemplare virtù, che ivi gloriosamente sofferse il martirio. Gregorio IV. vedendo, che mancato era lo splendore di quella città, rinnovolla di mura e di popolo, mettendovi i Corsi ad abitarla, e perchè spesso facevansi vedere i Saracini, Martino V. fecevi altissime torri con varie fortificazioni. E' notabile, che essendo poi stata presa da Menaldo Guerra di Navarra formidabile corsale, il quale teneva in gran terrore tutto li mare di quei contorni, Alessandro VI. che allora era Pontefice vi mandò Consolano, detto per soprannome il gran Capitano, il quale avendo superato e fatto prigione Menaldo, lo condusse a Roma legato sopra un cavallo magro, e sfornito come in trionfo, mettendo spavento a chi lo mirava. 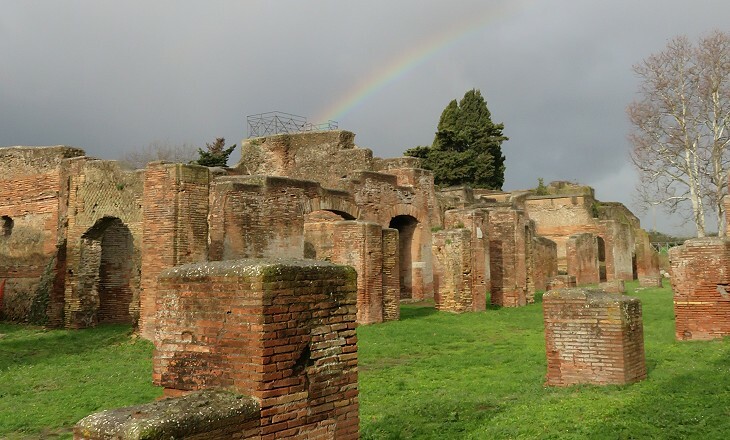 Per un tal felice successo il medesimo Pontefice si portò poco dopo in Ostia insieme col Duca Valentino, e con vari Cardinali, per godere quelle delizie; e per rendere più forte la città. Giulio II. vi aggiunse nuove fortificazioni con larga fossa; ma a poco a poco scemato il popolo per l'infelicità dell'aria, ora non rimane altro delle antiche grandezze, che un castello o rocca, per difesa di quella spiaggia, abitato da pochi operari delle vicine saline.